Y Axis being "Stubborn" Refusing to move? So I am pretty much done with the build. Just waiting on replacement leadscrew and bearings. Anyway, I keep have a reoccurring problem and its starting to get annoying. Its with the y axis. Yesterday I decided to start cleaning up the wiring so it not just hanging out the side of the electronics box. I wired up the LCD by routing the cables through the bottom holes. I pinned down the z axis cables so its nice and tidy. Shortened the AC power cables and zip tied them. It was looking great. Then I got to the y axis. 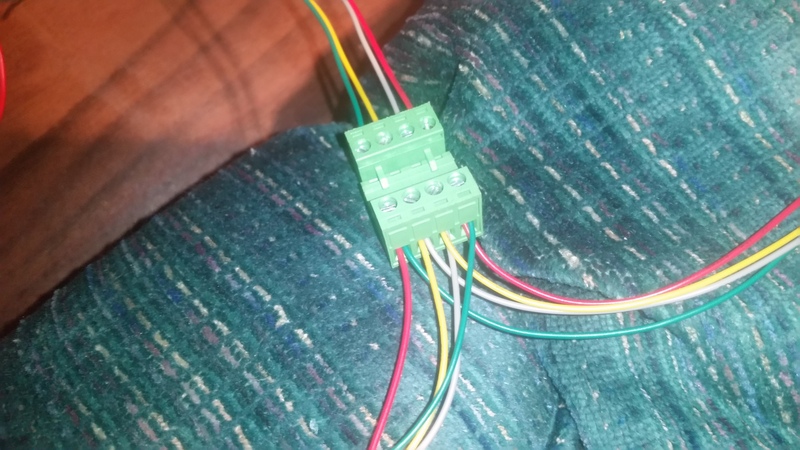 I had it currently wired in a way where I needed to remove the wires from the green 4 pin connector because the connector was larger than the wiring hole it was currently through. I simply removed the wires moves the wires and required it up with the wiring being mirrored for each motor, Without 2 of the same wires from the same motor touching. I went to home the axises to make sure they where all working. When the y axis homed it was in the wrong direction meaning I simply needed to flip my wiring. I did that and tried homing again, But nothing happened. I tried putting the wires back to the way they where before but still, Nothing happened. This happened before early after the build. I am not sure why. I never turn the printer on until I know for sure that its wiring is correct. I originally thought it was the stepstick, But now i'm not sure. Also I noticed in the manual that the y axis wiring is wrong. It says to insert 2 of the same colors from 1 motor, Which makes no sense. I even tested the continuity of every single wire from each motor connector to the board connector and everything is perfect. I'm getting confused. I tested the step stick on another axis and its working. Also one more question, Exactly what voltages should be set for each axis? The Y axis wires go color for color. Im pretty sure this is fixed in the new version. Ill check the link in the pinned post when I get home. EDIT: Don't know what I was thinking. Y IS reversed on one stepper. did you ever figure this out? im having the same issue, i cant get the y axis to move, checked all wires and just re did them for the third time.